Jet Airways, today connected Bengaluru with New York (Newark and JFK) and Toronto, via its European hub in Brussels with four weekly flights – on Fridays, Saturdays, Sundays and Mondays respectively, till December 14, 2008. In keeping with the higher holiday season passenger traffic, Jet Airways will increase its frequency on the sector, operating daily flights between Bengaluru and Brussels effective December 15, 2008 to January 15, 2009; and will revert to flying four times a week on the same sector, effective January 16, 2009 onwards. The launch of Jet Airways’ inaugural service on the Bengaluru-Brussels sector was marked by a multi-faith prayer session at the new Bengaluru International Airport, followed by the ceremonial lighting of the inaugural lamp by Mr. Albert Brunner, CEO, BIAL and Mr. Sudheer Raghavan, Chief Commercial Officer, Jet Airways. Flight 9W 132 departed the new Bengaluru International Airport at 0135 hrs, arriving at Brussels International Airport at 0755 hrs. On the return leg, Jet Airways flight 9W 131 will depart Brussels at 1010 hrs and arrive at Bengaluru at 0005 hrs the following morning. With the launch of these services, arriving passengers from Bengaluru can now conveniently connect to Jet Airways’ transatlantic services to North America and Europe in a seamless manner, on board its state-of-the-art Airbus 330-200 aircraft offering an unmatched international Premiere and Economy Class experience. 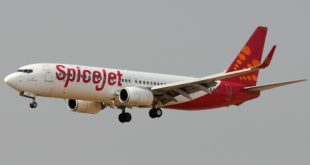 Jet Airways’ passengers can currently connect to six additional destinations in the United States and seven destinations across Europe through its code share partnerships with American Airlines and Brussels Airlines respectively. This enhanced connectivity on Jet Airways includes Washington Reagan, Dallas, Boston, Cleveland, Baltimore and Raleigh-Durham in the United States, via New York (JFK) and to Birmingham, Madrid, Barcelona, Berlin Tegel, Manchester, Paris De Gaulle and Lyon in Europe, via Brussels. Commenting on this new route development, Mr. Sudheer Raghavan said, “Jet Airways is proud to commence its signature wide body operations from Bengaluru to North America and Europe via its Brussels hub. Bengaluru will now be the fourth major Indian gateway for Jet Airways’ services to North America via Brussels, in addition to Mumbai, Delhi and Chennai”. Bengaluru is also the ninth Indian city to be connected to Jet Airways’ international network. 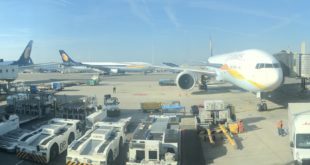 The Brussels hub operation is ideally suited to offer Jet Airways’ customers flexibility with flight timings, to connect India with North America and Europe. Passengers from Bengaluru will experience Jet Airways’ dual-class, state-of-the-art Airbus 330-200 aircraft featuring its acclaimed herringbone-configured Première, which makes every seat an aisle seat .Besides converting to 180 degree flat beds with lumbar support and massage systems, Première seats also offer the busy business traveller oversized tables, laptop power, telephony, SMS, Email and live text news. The spacious new Economy class, passengers will enjoy seats more spacious than the norm and ergonomically designed to reduce stress and strain for perhaps the most comfortable ride in its class.